The pallet may be the common denominator of the logistics industry but not all pallets are the same and there is endless argument about which pallet material has the least impact on the environment. In this article, I help to clarify the debate. WHICH KIND OF PALLET IS THE GREENEST? Pallets get a lot of bad press. Some people say that too many end up in landfill sites. Others argue that the wood used to make the overwhelming majority of them results in deforestation and therefore contributes to global warming. Then there are other environmental issues, such as the wooden pallet’s role as a means of migration for unwanted pests such as the Asian Longhorned Beetle. "There are good reasons why the wooden pallet has clocked up some 90 years in the logistics industry." 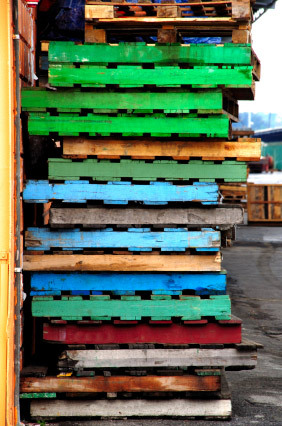 Plastic pallets are not as green as they claim – Naturally, plastic pallet manufacturers point to the long lifespan of their products and the fact that they are lighter – typically by 30% – and so help to reduce fuel consumption. That’s all true, of course, but is unlikely to tip the scales given the environmentally harmful impact of manufacturing and oil-based product. You need to distinguish between pooled wooden pallets and non-pooled ones – The fact is that these types of wooden pallet are different in construction and this has an effect on their environmental impact. Although a pooled pallet has a better lifespan, its high weight results in higher transport costs and thereby greater carbon footprint. A non-pooled wooden pallet is lighter and has the lowest environmental impact at the point of manufacture but has a shorter life. Wooden pallets do not result in deforestation – Many pallet suppliers use only wood certified by an accredited environmental body, such as the FSC (Forest Stewardship Council) or PEFC (Programme for the Endorsement of Forest Certification). In any case, trees are generally not cut down to make pallets. The wood used for pallets is a by-product of the timber used in the construction of houses and furniture. The best wood is reserved for these items and the humble pallet is made from the off-cuts. Most wooden pallets are recycled – Timber recovered from damaged pallets is used to manufacture vast numbers of reconditioned pallets and other packaging materials. A recent survey in the US found that over 70% of all wooden pallets are now recycled – a much higher recycling rate than for aluminium, paper or plastic. Another report found that less than 5% of wooden pallets end up in landfills and, of course, they biodegrade there anyway! Wooden pallets can be chipped into fuel – Any wooden packaging waste that cannot be used to make reconditioned pallets can be turned into wood chip fuel. This is currently the cheapest form of heat energy on the market and is a sustainable and renewable source of fuel for heating or power. So, is it a coincidence that the most ‘natural’ material for a pallet turns out to be the most environmentally friendly? Perhaps not. Wooden pallets are reusable, repairable and recyclable because they’re made from timber – which is renewable, sustainable and biodegradable.